X-Ray detectable gauze swabs are made of 100% highly absorbent cotton yarn, bleached by hydrogen peroxide to a good white and free from optical whiteners and foreign matter BP/USP/Sch. F-II. X-Ray detectable or Radio-Opaque swabs contain a distinctly colored filament containing barium sulphate which is clearly visible under radiography test. 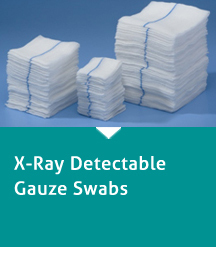 X-Ray Detectable gauze swabs are soft, conforming and highly absorbent and suitable for all surgical procedures for absorbing blood & exudates during surgeries. Machine-made with pharmacy / surgical folds. It's clear visibility under C-arms and X-ray makes it a preferred choice for all health care specialist. Bulk non-sterile swabs are available in various sizes and ply (layers) packed in 100's/200's in poly bags / paper bags. 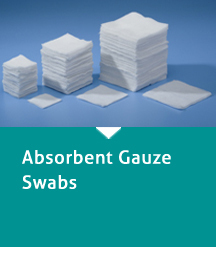 Gauze swabs are soft, conforming and highly absorbent and suitable for cleaning wounds, incisions, abrasions and ideal for covering low to mild exudation wounds as a primary dressing. Machine-made with pharmacy / surgical folds. 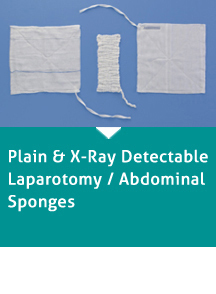 Plain & X-Ray detectable lap sponges are made of 100% highly absorbent cotton yarn, bleached by hydrogen peroxide to a good white and free from optical whiteners and foreign matter BP/USP/Sch. F-II. X-Ray detectable or Radio-Opaque lap sponges contain a distinctly coloured filament containing barium sulphate which is clearly visible under radiography test. They are neatly stitched along the edges as well as diagonally to prevent any loose threads, fraying of edges and shifting of inner layers. It's clear visibility under C-arms and X-ray makes it a preferred choice for all health care specialist. 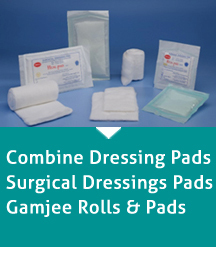 Combine dressings / gamjee rolls & pads are made of a highly absorbent layer of cotton wool wrapped in an absorbent layer of cotton gauze or non-woven. They are used mainly in post-operative procedures to cover the wound / incision / abrasion from being exposed to dust and other impurities and at the same time absorb mild exudates. Soft & absorbent and conforming to body contours, they help in faster healing of the wound / incision. Gauze & bandage rolls are made for highly absorbent 100% cotton yarn, bleached to a good white and free from optical whiteners starch & other impurities. 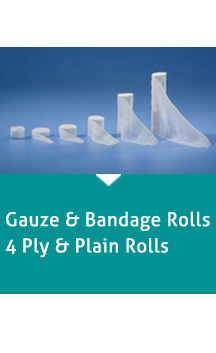 Single layered gauze and bandage rolls are used as a secondary dressing to hold the primary dressing in place over the wound or incision. Soft and conforming they provide much needed flexibility to the patients and at the same time help in faster healing of wounds. Available in 2"/ 3"/ 4" & 6" widths and in lengths of up to 10 meters. Packed in•	4-Ply gauze rolls are commonly used in CSSD of hospitals, where the CSSD staff cut the rolls and fold them as per their required sizes. Available in common size of 90cm x 90 meters, they generally weigh about 1.00 kg to 1.40 kgs depending on the requirements of the end users. 4-Ply narrow width rolls are used in ENT & Gynec procedures and are available in widths of ½"/ 1" / 2"and in 2 meter lengths. Sterile Non-Adherent Pads are an improvement over the combine dressing pads consisting of a layer of 100% absorbent viscose sandwiched between two non-adherent micro-porous medical grade films. Placed on a wound, the pads absorb the exudates and keep the wound contact layer dry and allow for faster tissue regeneration. The exudates are absorbed through the microporous film and get retained in the viscose layer. As the would contact later does not stick to the wound surface dressing change or removal is painless & atraumatic for the patient. Soft & conforming they can be applied to any part of the body surface and are easily fastened by an adhesive tape. 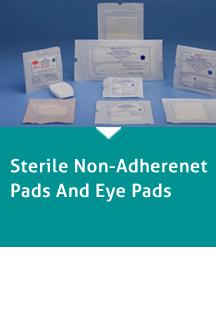 Sterile Eye Pad as the name suggest are used as post-op eye dressings. Fluffy & soft, they provide a soothing relief to patients. Available in standard oval shapes covering the complete eye.